What? You've got to be kidding. Sure, yes, absolutely. Kidding is fun. Okay, let's look at the Senior Scooter and Toilet practically. Mobility can be a challenge for the elderly. And then there's incontinence. Okay, TMI. 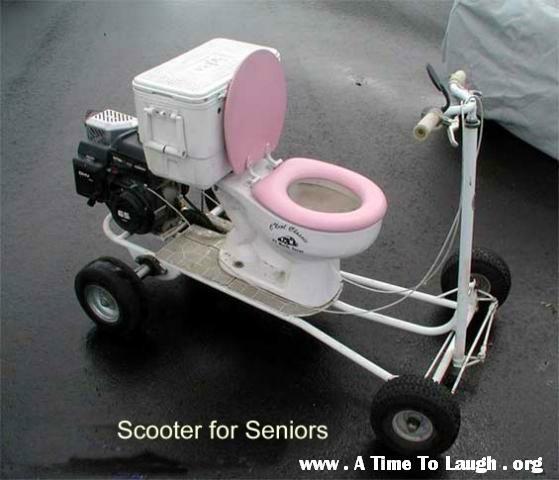 Just points out the usefulness of the Senior Scooter Toilet. Do you Need a Senior Scooter? Okay, be honest with yourself. Think of the practical applications! Be the first one on your block to start the latest trend. Raise the bar and boldly zoom through your neighborhood on your own customized senior scooter! A police officer is sitting behind the billboard, enjoying the light summer breeze, listening to classic Tommy Dorsey on the radio, and watching for speeders who may be passing his position. Rather than seeing a speeder, the next vehicle passing his position is a vintage 1976 Triumph Tiger 750. And it's going rather slow, slow enough to obstruct traffic. He pulls out to follow the motorcycle rider, and to his surprise, sees there are two elderly nuns on the bike. He turns on his police cruiser lights and taps the siren briefly. The nun on the front signals a turn, pulls over to the side of the road, and turns off the motorcycle engine. "Are you alright?" "You're driving exceptionally slow ma'am." "I'm sorry officer. My colleague, Sister Mary Marie and I are on our way to the village fete in Winchester, Hampshire. We've been looking forward to it all week." "I was unfamiliar with this road, but saw a road sign with the number A31." "So I naturally assumed the speed limit was 31 kilometers per hour." "No mum", the officer explained. "The speed limit is 100 kilometers per hour." "The A31 is the Highway Number." That's when the policeman noticed the other nun, Sister Mary Marie, the passenger. She was shaking like a leaf, tears in her eyes, and could only mumble, unable to gain her composure. "Excuse me Sister, what's wrong with your passenger?" "Oh, that may be because we were riding on Highway A272 before we turned on to this road." A successful, single, young businessman, a rising star in his company, wants to impress people. His friends, his colleagues, and of course, the ladies. He does his research, lays out his finances, and buys a BMW Z24 Roadster. He is so proud of his new car. He eases it out of the drive, takes it for a spin through the countryside, and enters a small town. As he approaches and stops for the traffic light, an old man who must have been 90 years old or more, pulls along beside him on a Honda Hobbit PA-50 Moped. The old man looks over at him and says, "What kind of car you got there sonny?" The young man is pleased, "This is a BMW Z24 Roadster." "It costs $46,000 ." "Wow". "Why would you spend that much on a car, what does it do?" "Well Pops, it can cruise at 200 miles per hour for starters." Said the young man. The old man replied: "Can I take a look inside?" The old man leans over on his Moped, looks at the interior through the open car window and says: "Well young man, it sure looks pretty. Yep, sure does." About that time, the traffic light changes from red to green. The young man, again eager to impress, steps on the accelerator hard. He wants to show this old man what his new car can do. Zero to 60 mph, to 90 mph, to 120 and 150 mph. That's when he notices a really small dot in his rear-view mirror. And the dot is getting closer. He slows down quickly in case it's a police officer. Suddenly the dot is upon him, and actually goes right past him. He can't believe his eyes. It looks just like the old man on the Moped. 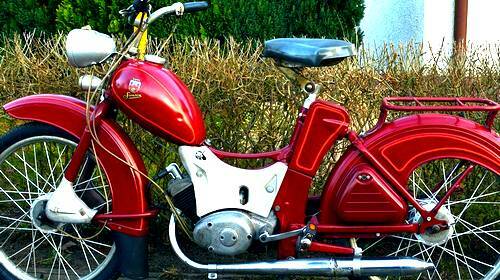 How could the PA-50 Moped possibly keep up with his BMW Z24, and in fact, go past him? And then it goes past him backwards, and is once again behind his car. That's when it springs forward and hits the car. He stops, jumps out, and runs to the back of the car. He can't believe it. The rear of his brand new Beemer is scraped, dented, and caved-in. It's the old man on the Moped. He immediately reaches to help the old man who may be near dying. "Man you look bad, where does it hurt?" "How can I help you mister?" "You can start by unhooking my suspenders from your side-view mirror!